BUFFALO, N.Y. -- One-time Republican candidate for New York governor Carl Paladino, whose published insults of former President Obama provoked a public uproar, was removed from Buffalo's school board Thursday for improperly discussing teacher contract negotiations. State Education Commissioner MaryEllen Elia announced her decision Thursday, a day after Paladino protesters disrupted the school board's latest meeting with calls for his ouster. Paladino said Thursday that he believes the decision is a "sign of the times," CBS affiliate WIVB reports. "It's like nothing's normal anymore, or what we would refer to as legal or normal," Paladino said. "These people in Albany, they are very easily influenced by politics." Paladino's lawyer said he would appeal the decision, which he suggested may have been influenced by the country's mood in the wake of a violent white nationalist rally in Charlottesville, Virginia. Attorney Dennis Vacco said that although Paladino was kicked off the board for writing about confidential board business, the monthslong campaign for his removal has centered on Paladino's "vile" comments about Obama and former first lady Michelle Obama. "It's not lost on me that just last night, protesters were at the board of education hearing again protesting Carl and attempting to link Carl to the unfortunate events in Charlottesville," Vacco, a former state attorney general, said. The ruling comes after a five-day hearing in Albany, a formal petition by the school board for his ouster, according to WIVB. 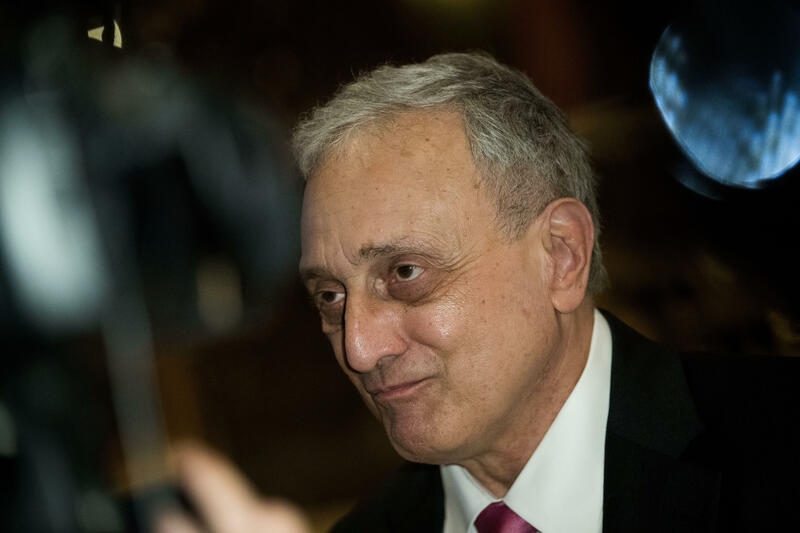 The protests have been happening since December, when Paladino, who helped chair President Trump's campaign in New York, told a local arts newspaper he wished Obama would die of mad cow disease. But it was a later article written by Paladino detailing closed-door teacher contract negotiations that led to his removal. Elia sided with fellow school board members who said Paladino had willfully disclosed confidential discussions, including the superintendent's "panic" over the threat of a teacher strike. The revelations revealed vulnerabilities that ultimately benefited the teachers' union and other units with pending contract negotiations, union and school board officials testified during a hearing in June. Paladino had argued his disclosures more than two months after an agreement was reached were justified because his intent was to inform his constituents about what he viewed as "a scheming and rigging of a contract." Elia also rejected Paladino's contention that the board's real reason for the removal petition was retaliation for his Obama comments, which he said were not meant for publication but nevertheless protected by his constitutional right to free speech. A federal lawsuit filed by Paladino against the board accuses members of attempting to stifle that right. The Obama comments may have set into motion Paladino's ouster, Elia wrote, but Paladino's subsequent executive session disclosures "provided a new, independent ground for seeking (Paladino's) removal." The commissioner's ruling disqualifies Paladino, the Republican nominee for New York governor in 2010, from appointment or election to any district office for one year. The wealthy developer was elected to the school board in 2013 and re-elected by a narrow margin in 2016. "There is absolutely no place in public education for someone who flagrantly disregards the rules and spouts disgusting, racially charged ideas that harm students and the teaching environment," New York State United Teachers said in one of several statements issued by organizations in support of Elia's decision. The Education Trust's New York chapter, invoking last weekend's violence in Virginia, said the issue was "much deeper" than contained in the limited ruling. "As we've seen from the recent events in Charlottesville, we have a long way to go as a country to combat hate and intolerance" the organization said, "and elected leaders at every level from the local school board to the president must be held accountable for the tone they set and for the lessons their words teach young people." School board President Barbara Nevergold said Elia's ruling confirms that it's not for individual board members to decide what is confidential and what should be made public. She said she hopes Paladino's removal clears the way for more productive meetings. "There has been a lot that has occurred at this board table and outside that has really been due to the behavior of Mr. Paladino," Nevergold told reporters inside the City Hall meeting room. "We're looking forward to being able to move forward without the distractions that have accompanied his behavior." Paladino's remarks about Obama were part of an end-of-the-year Artvoice article that posed questions to high-profile, Buffalo-area personalities about the year ahead. When asked what he'd like to happen in 2017 and what he'd like to see go away, Paladino replied he wanted Obama to die of mad cow disease and Michelle Obama to "return to being a male and let loose in the outback of Zimbabwe where she lives comfortably in a cave with Maxie, the gorilla."